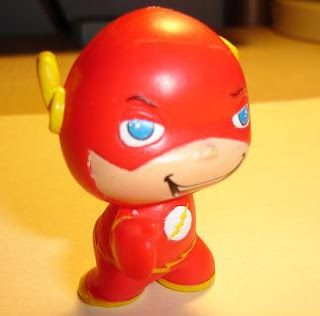 It's Flash Friday! Remember all that muck up two weeks ago with the review that never happened? It's happening today! There was a huge mix up between me and the post office, but everything is fixed now. Really the whole thing was quite embarassing. Getting back to the review though, today is all about Little Mates. 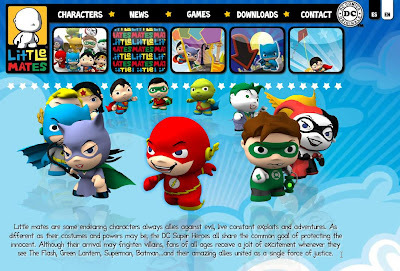 Little Mates were created by a company called Silver Line and distributed as a newspaper promotion in Spain. Silver Line has been around for over twenty years doing things like fast food promotions. You can find out more about the Little Mates and Silver Line and their website, here. The first wave of figures is pretty impressive too. Of course you have Batman and Superman, but you also have Hawkwoman and Martian Manhunter. Aquaman, Wonder Woman, Robin, Joker, Harely Quinn, Green Lantern, and the Flash round out the line. So it is certainly Bat heavy, but since this is targeted at the mass market that isn’t surprising. The website is pretty nicely put together too. If the link sends you to the Spanish version there is a button to switch it over to English. 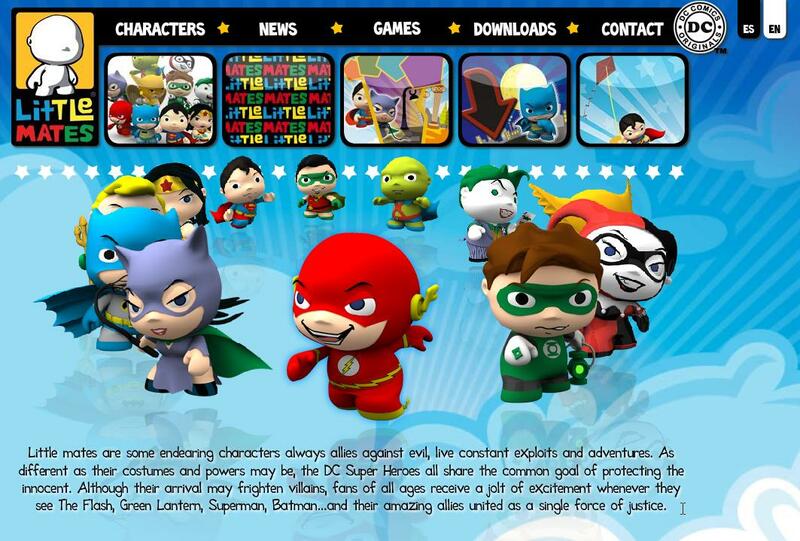 There are games, downloads, and character profiles. The Flash profile is pretty detailed considering this is a website that has coloring book pages you can print out. The costume matches up with it being Barry Allen. So they got that right, the home town is dead on too. This thing even mentions the Speed Force. 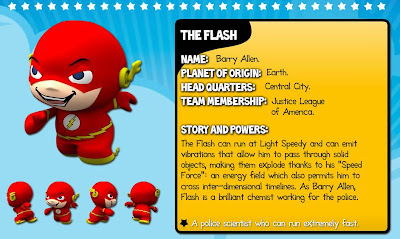 The get Barry and Wally mixed up when mentioning that moving through objects causes them to explode, but otherwise I was surprised how good the information was. Enough about the website; how is the figure? The sculpt is very similar to Kid Robot’s Munnys; just much smaller. You get zero points of articulation. He's got some weight to him though. Not sure what he is made of but it feels like the same kind of rubbery plastic they used to make Smurfs out of. He is very stable though, even in his running pose he hasn't fallen over once. And he is tiny. At two inches even the Action League tower over him. Well maybe not tower, but they are taller. The paint app is very clean on mine, there isn't any overlap or anything. I’m really impressed with the little details. For such a small figure they got a lot of things right. His eyes are blue. 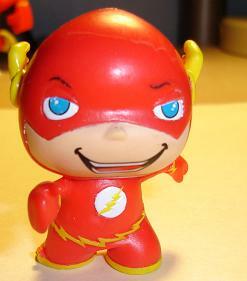 We’ve talked about how important eye color is to Flash fans before. Even more surprising is that most the characters in the line just have black circles for eyes, so it must have been a conscious decision to go with the blue. You also get little wings on his boots. Easily this detail could have been overlooked, but they look fantastic on him. Sure, at that size they are just tiny bumps, but they are there. For such a tiny guy he is impressive. So what will this run you? Well unless you are in Spain, you’re going to have to go the Ebay route. I got mine for 13, your luck may vary. So a little pricy, but considering it is exclusive to another country it isn’t too bad. 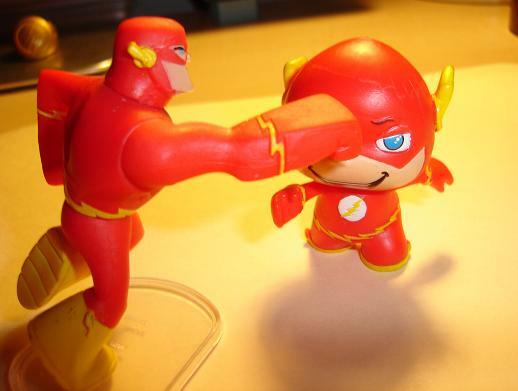 Add in shipping and well, I probably paid too much, but I’m happy the little guy is going to be joining my other Flash figures.